If you signed up for the free trial of Google Music All Access shortly after it was announced at Google I/O, then prepare to either pay a monthly fee going forward or cancel, as your free trial is close to ending. The 30-day free trial for many of us who signed up immediately, expires in a few days, which Google has kindly reminded us of in an email. Keep in mind that if you become a paid customer before June 30, and since you started the trial before that date, you can lock-in for $7.99 per month. If you don’t start a trial or paid service before June 30, the service will run you $9.99 per month. I personally am a huge fan of the service and use it constantly throughout the day both at home and whenever I’m in my car. At $8 per month, I can listen to my own music whenever and wherever, but also grab the newest albums that have been released to Google Play without having to buy them. There are no streaming limits (unless you have a tiny tiered data plan through your carrier), you can pick and choose tracks from Google’s entire catalog of music for playlists, and there is even a radio feature like Pandora or iTunes Radio, but it’s so much more powerful. I’ll definitely become a subscriber. 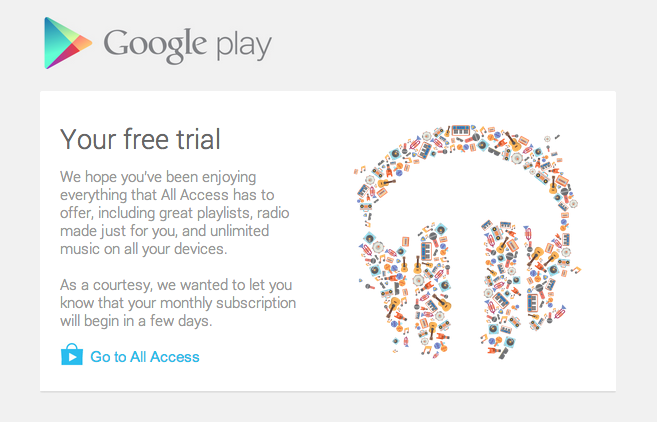 Anyone else taking the plunge and sticking with All Access after the trial?